Did Australia really ban all guns? Some of my American friends are arguing again on Facebook about what Australia did about gun laws in 1996. Did we ban all guns? No. Here’s what happened. In Australia we banned semi-automatic weapons (for almost everyone – see below) after the Port Arthur massacre in 1996 (35 dead) and we haven’t had a mass shooting since. Farmers can have rifles to destroy livestock. Target shooting clubs that practice for the types of competitions that lead to the Olympic or commonwealth games competitions can have the type of guns that are used in those competitions. (You have to use the club’s guns for the first six months.) Duck hunters can still go duck hunting, but not with self-reloading shotguns. Some security guards (mostly those who accompany cash deliveries to banks) carry guns, for obvious reasons. You need a licence to buy a gun, and you need a reason. ‘I just feel like it’ isn’t a reason. Individual owners are licensed and individual guns are registered. You can’t just go down the street and buy a gun. Semi-automatic weapons are banned, except for professional hunters (e.g., people who do feral culling) and farmers for destroying livestock, and then with limits (10 shot) on the magazine size. The state governments bought back a bit over 600,000 guns at market prices. Banning semi automatic weapons was the important point, because that is what do you need to conduct a successful mass shooting. The whole country was behind this change. There have been some individual shootings since (1 or 2 or 3 dead, mostly domestic murder- suicides.) but no public mass shootings of the sort that happen in america. Our (conservative, very pro-American) Prime Minister at the time, John Howard, actually used the expression “we are not going to go down the American path.” We collectively came together in away that was stunning in 1996. We acted like a society, fixed a problem, and we have no reason to go back. And no, other crime rates haven’t risen because innocent people can’t defend themselves. Our long-run trends for most crimes like burglary and house invasions are down. (Remember to always look at crime rates – that means crime per 100,000 head of population, not raw numbers which can be expected to rise anyway because of population increase. And look at long run rates, not year to year fluctuation. Those wishing to get some data can go the the Australian Bureau of Statistics and the Australian Institute Of Criminology websites for serious data. Some crimes are rising, such as ‘newer’ issues like ice addiction. 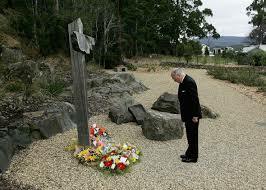 Description of Port Arthur Massacre here. Description of Australia’s gun laws here. Article on process of the buy-back and law here. Previous PostIs voting for the lowest tax candidate always the best idea?Next PostWould you risk your life for the right to vote?